!Uris Safari Lodge is located 20 kilometres west of the town of Tsumeb in Namibia's diverse and fascinating Oshikoto Region. 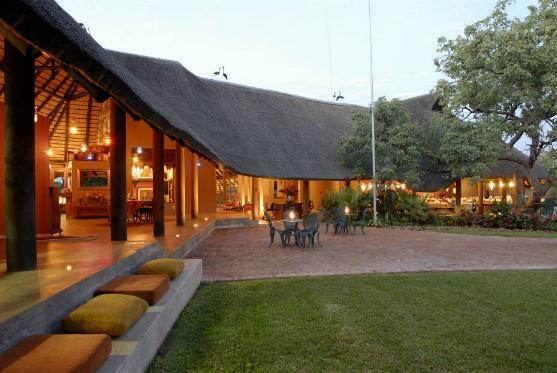 The Lodge nestles in a 17,000 hectare private game reserve with an abundance of Eland, Kudu and other game. Historically there were eight existing "kompong" houses which accommodated the mineworkers in the early nineteen hundreds. These houses were revamped and now !Uris Safari Lodge features these cosy houses as comfortable furnished brick and thatch-chalets, each with air-conditioning and en-suite bathroom. All room names refer to current and previous existing mines. Hosts accommodate a maximum of 42 guests in 14 rooms consisting of seven semi-detached chalets. There are seven queen bedrooms. The other seven family bedrooms are furnished with four three quarter beds, of which two beds are fitted on a loft, ideal for kids between 6 and 12 years of age, only. 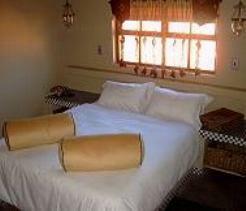 All beds are of extra length and the inviting bohemian looking rooms are rounded off with mosquito protecting nets. 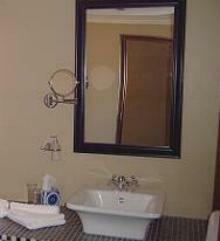 Rooms are equipped with amenities, towels, hair dryer, electric kettle, digital safe and telephone facilities. Electric appliances all run on 220/240 volts. The thatched dining, lounge and bar areas open onto spacious wooden decks, affording views over Namibia's world-renowned sunsets. 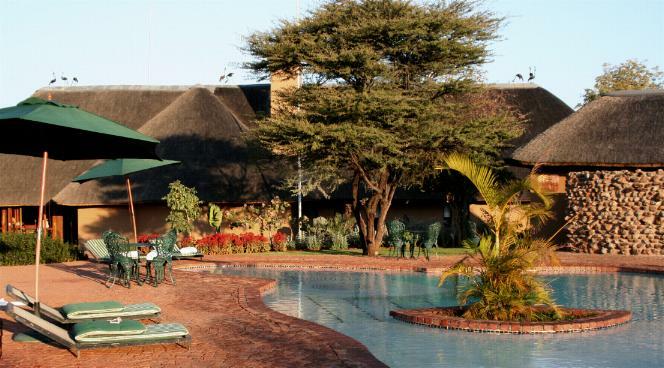 !Uris Safari Lodge boasts delicious Pan African meals including full breakfast, lunch and dinner by candlelight. 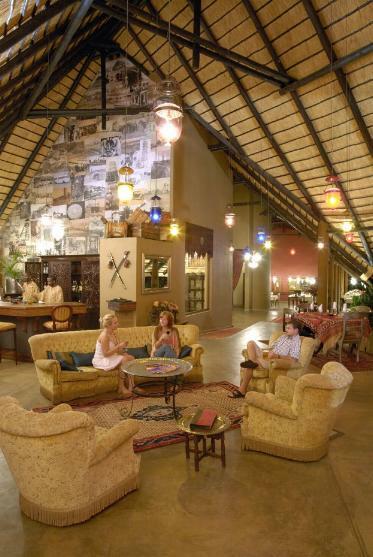 Dinners are either served in the lounge area or for guests favouring the "bush experience" the BOMA is a favourite. In the "Footsteps of the Diggers" runs like a delicate string of copper through out the lodge. If it is not at cosy fireplace in the lounge area, mining history is available at the small scale library, as well as small bits of mineral collections are available at the curio shop. "Dig" for wine, as you have to go down in the wine cellar with resemblance to the Tsumeb mineshaft. Round off your day with a lovely cigar in the Cigar Bar. A fantastic designed swimming pool is available for guests to relax in, not to mention a small eighty-seat chapel for weddings or just quiet contemplation. Special occasions can be booked at the Boma. Hosts offer a breakaway conference experience for the nature lover. Their state of the art conference room can seat up to hundred delegates - theatre style seating - fully equipped with all the standard conference necessities, e.g. video conferencing, big screen TV, projector and e-mail facilities. Activities: The Tschudi area is known as a breeding ground and natural habitat for Eland. The 17,000 hectare Eland conservancy offers new sights and the opportunity to immerse yourself in nature from the back of a donkey cart or at a leisurely walking pace on one of the walking trails. Before sunset when the burning heat of the African sunshine has diminished one can take a nature drive through the bush to view some of Africa's most majestic antelopes: eland and kudu. One can also view duikers, steenbok, warthog, jackal, ant bear, leguan (monitor lizards), and baboon. Tsumeb Museum & Mining tours can be booked. The Tsumeb Museum, with its comprehensive historical and geological displays, is a major tourist draw card which attracts between 12,000 and 15,000 visitors annually. Donkey cart rides are available to historic !Uris abandoned mining sites in the vicinity. Sightseeing trips to Tsumeb and the Etosha National Park can be arranged. Geological tours are done on request. Wilderness camping is available on a camp site about 5 km from the lodge. Abundant bird life is a !Uris hallmark. One can see crimson-breasted shrikes, bulbuls, Cape turtle doves, bleating warblers, gray loeries, Namaqua doves, green-spotted doves, plum-coloured starlings, francolins, Guinea fowls, yellow-billed and red-billed hornbills, lilac-breasted rollers and a variety of bee-eaters, lovebirds and sunbirds. Tsumeb Museum, Tsumeb Cultural Village, Tsumeb Arts and Crafts Center, De Wet Shaft and the Tsumeb Upper Levels Smelter and Mine. Otjikoto Lake, Guinas Lake, Hoba Meteorite, Grootfontein Museum, African Baobab Trees (Tsintsabis area) the famous Etosha National Park. Tsumeb has a challenging and beautifully landscaped nine-hole golf course, complete with driving range and clubhouse. A short distance from Tsumeb is a well-established shooting range operated by the German shooting club, Schützenverein. Skydiving at the Tsumeb Flying Club can be arranged by appointment.